In the 2000s, the Parkers thought they were buying their dream home. It was advertised at an excellent price and came with customizable options. The home was located in Peoria, Arizona, adjacent to Phoenix. The development was new, with an HOA managed by a management company. While the Parkers were viewing the house, they asked the salesperson if they would be able to expand their three-car garage to a four-car garage. The sales person said yes, that would be no problem. In 2016, the Parkers proudly put up a campaign sign in their front yard for Donald Trump, the only homeowners in the development to do so. Mr. Parker was elected to the HOA board for awhile, but left after getting frustrated. But while there, the family learned the rules for additional building on the property and complied when they started their garage addition. This meant sending a letter requesting permission to the HOA board along with a copy of the plans and the permit from the city. Per the HOA rules, if the HOA board doesn’t respond to a request within 45 days, it’s deemed approved. A few weeks later, the city asked them to change their building plan slightly. They made the changes and submitted the revised plans to the HOA. Again, the HOA board did not respond within 45 days, so the Parkers thought everything was fine. They resumed construction of the garage. On January 9, 2017, when the garage was close to completion, the Parkers received a Notice of Violation in the mail from the management company. It did not specify any offense. They were then contacted by the Architectural Review Committee, a subsidiary of the HOA. The ARC chairman CC’d two neighbors on an email to them. The Parkers figured out he had put two of his neighbors on the ARC — but there hadn’t been a meeting, necessary to vote in officers, since October 2016. They were apparently put on the ARC illegally. An HOA board member was also later added illegally, to replace the president of the board who moved out of the development. The HOA justified it by claiming that A.R.S. 10-3821 applied, allowing them to take action without a meeting. But that law applies to nonprofits, not HOA boards. HOAs are different because they include homeowners who have a right to vote. They are governed by Title 33 of the Arizona Revised Statutes. The HOA board next sent the Parkers a letter refusing permission to build the additional garage — despite the fact that it was already built at this point. The ARC claimed that one corner was too close to the fence. This was because the city had them move the garage back, which changed the distance from 10 feet to 8.2 feet. The Parkers thought they could submit a variance to take care of the problem. Instead, they received a letter from an HOA lawyer on April 20, 2017. There still hadn’t been any HOA board meetings since October, so the legal action appeared to be illegal. On May 5, the law firm sent them another letter, selectively quoting the CC&Rs. The HOA finally sent out a letter announcing a board meeting in August, almost a year after the last meeting — but it was executive session only, so residents weren’t allowed to attend. The HOA lawyer attended along with the illegally elected board members. The Parkers asked for mediation. It took place in September. At the mediation, one member on the HOA board suggested fining the Parkers as much as $35,000, as a “deterrent” to others. The HOA finally scheduled a board meeting for residents to attend on December 17. It was chaotic, with other residents angry at the way the HOA was treating them. An election was scheduled for January to elect new officers. Ken Palmer ran for president, but the HOA pulled some slick maneuvers to keep him from being elected. The Parkers finally could not handle any more stress, it was having an effect on Ken’s health. They were told that even if they were to eventually win, they would have to go through a lengthy appeals process that would cost them $50,000. They worked out a settlement of paying the HOA $10,000. They spent another $13,000 on legal fees. They essentially paid a lot of money to make it go away. The management company was started in the 1990s. It has expanded to manage 700 HOAs. It operates in five states. There are thousands of employees. They collect payments, bank them, keep records, pay for insurance, hire vendors, manage the property, fix sprinklers, pay for a community manager to be on call, manage meetings and make filings at court. They also manage pools and common areas in the HOAs that have them. Officially, the management company receives nominal reimbursement from homeowners’ fees. But they actually make their money from secret affiliate fee arrangements. In order to bid on projects in the development, vendors must join the Community Association Institute. That requires them to give a hefty kickback of 20 to 30 percent to the management company on each project. That money is how they are able to litigate against homeowners. The management company also makes money suing homeowners over HOA fines. If they don’t keep up with the fines, they foreclose on their homes and flip them, making a profit. Free market proponents don’t want to regulate HOAs because they consider them private associations. But several court decisions have held that they are quasi-governmental. Phoenix lawyer Jon Dessaules, who represents homeowners in lawsuits against HOAs, observed, "Homeowners associations really are privatized government without accountability. We can control everything from what you paint your home to when you cut your yard, but we aren’t accountable to you and don’t have to respond to you." They are similar to Public-Private Partnerships, which entail government granting monopolies to favored corporations which no longer act like free market entities and are controlled substantially by government. Local governments authorize developers to include HOAs. Since 90 percent of the new houses in Maricopa County are located within an HOA, it is almost impossible to avoid them. 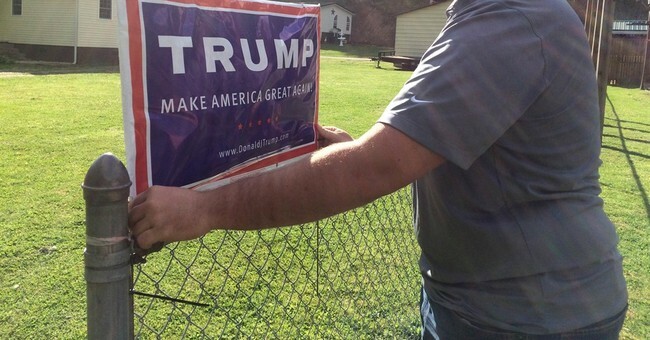 The Parkers believe they were originally targeted because of their Trump yard sign. Many of the people attracted to serve on HOA boards are little Napoleons, eager to flaunt their power over others. This totalitarian mindset should not be allowed to abuse people for their politics. Fortunately, Arizona’s Governor Doug Ducey is cracking down on HOA abuse. One bill would have helped the Parkers, requiring HOAs to treat all of their meetings as open meetings. But it’s too late for them.